"A's" redirects here. For other uses, see As and A (disambiguation). The Athletics' name originated in the term "Athletic Club" for local gentlemen's clubs—dates to 1860 when an amateur team, the Athletic (Club) of Philadelphia, was formed. (A famous image from that era, published in Harper's Weekly in 1866, shows the Athletic players dressed in uniforms displaying the familiar blackletter "A" on the front.) The team later turned professional through 1875, becoming a charter member of the National League in 1876, but were expelled from the N.L. after one season. A later version of the Athletics played in the American Association from 1882 to 1891. In 1963, when the A's were located in Kansas City, then-owner Charlie Finley changed the team mascot from an elephant to a mule, the state animal of Missouri. This is rumored to have been done by Finley in order to appeal to fans from the region who were predominantly Democrats at the time. (The traditional Republican Party symbol is an elephant, while the Democratic Party's symbol is a donkey.) Since 1988, the Athletics' 21st season in Oakland, an illustration of an elephant has adorned the left sleeve of the A's home and road uniforms. Beginning in the mid 1980s, the on-field costumed incarnation of the A's elephant mascot went by the name Harry Elephante. In 1997, he took his current form, Stomper. After buying the team in 1960, owner Charles O. Finley introduced new road uniforms with "Kansas City" printed on them, as well as an interlocking "KC" on the cap. Upon moving to Oakland, the "A" cap emblem was restored, although in 1970 an "apostrophe-s" was added to the cap and uniform emblem to reflect the fact that Finley was in the process of officially changing the team's name to the "A's". Also while in Kansas City, Finley changed the team's colors from their traditional red, white and blue to what he termed "Kelly Green, Wedding Gown White and Fort Knox Gold". It was also here that he began experimenting with dramatic uniforms to match these bright colors, such as gold sleeveless tops with green undershirts and gold pants. 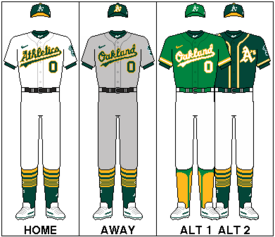 The innovative uniforms only increased after the team's move to Oakland, which also came at the time of the introduction of polyester pullover uniforms. During their dynasty years in the 1970s, the A's had dozens of uniform combinations with jerseys and pants in all three team colors, and in fact did not wear the traditional gray on the road, instead wearing green or gold, which helped to contribute to their nickname of "The Swingin' A's". After the team's sale to the Haas family, the team changed its primary color to a more subdued forest green and began a move back to more traditional uniforms. Currently, the team wears home uniforms with "Athletics" spelled out in script writing and road uniforms with "Oakland" spelled out in script writing, with the cap logo consisting of the traditional "A" with "apostrophe-s". The home cap is green with a gold bill and white lettering, while the road cap, debuting in 2014, is all green with "A's" in white with gold trim. Regardless of road or home games, the batting helmets used are green with gold brim. However, before 2009, when the black A's helmets appeared, road helmets were green with green brim. The nickname "A's" has long been used interchangeably with "Athletics", dating to the team's early days when headline writers wanted a way to shorten the name. From 1972 through 1980, the team nickname was officially "Oakland A's", although, during that time, the Commissioner's Trophy, given out annually to the winner of baseball's World Series, still listed the team's name as the "Oakland Athletics" on the gold-plated pennant representing the Oakland franchise. According to Bill Libby's Book, Charlie O and the Angry A's, owner Charlie O. Finley banned the word "Athletics" from the club's name because he felt that name was too closely associated with former Philadelphia Athletics owner Connie Mack, and he wanted the name "Oakland A's" to become just as closely associated with him. The name also vaguely suggested the name of the old minor league Oakland Oaks, which were alternatively called the "Acorns". New owner Walter Haas restored the official name to "Athletics" in 1981, but retained the nickname "A's" for marketing purposes. At first, the word "Athletics" was restored only to the club's logo, underneath the much larger stylized-"A" that had come to represent the team since the early days. By 1987, however, the word returned, in script lettering, to the front of the team's jerseys. Prior to the mid-2010s, the A's had a long-standing tradition of wearing white cleats, which date back to the Finley ownership. In recent years, however, the MLB gradually relaxed its rules on specific sneaker colors, and several A's players began wearing other colored cleats, most notably Jed Lowrie's green cleats. Since the mid-2000s the A's have been in talks with Oakland and other Northern California cities about building a new baseball-only stadium. The team has said it wants to remain in Oakland. On November 28, 2018, The Athletics announced that the team had chosen to build its new 34,000-seat ballpark at the Howard Terminal site at the Port of Oakland. The team also announced its intent to purchase the Coliseum site and renovate it into a tech and housing hub, preserving Oracle Arena and reducing the Coliseum to a low-rise sports park as San Francisco did with Kezar Stadium. Most of the city's claims were dismissed in October 2013, but a U.S. District Judge ruled that San Jose could move forward with its count that MLB illegally interfered with an option agreement between the city and the A's for land. On January 15, 2015, a three-judge panel of the 9th U.S. Circuit Court of Appeals ruled unanimously that the claims were barred by baseball's antitrust exemption, established by the U.S. Supreme Court in 1922 and upheld in 1953 and 1972. San Jose Mayor Sam Liccardo commented that the city would seek a ruling from the U.S. Supreme Court. On October 5, 2015, the United States Supreme Court rejected San Jose's bid on the Athletics. A 2017 plan would have placed a new 35,000 seat A's stadium near Laney College and the Eastlake neighborhood on the current site of the Peralta Community College District's administration buildings. The plan was announced by team president Dave Kaval in September 2017. However, just three months later, college officials abruptly ended the negotiations. The Bay Bridge Series is the name of a series games played between (and the rivalry of) the A's and San Francisco Giants of the National League. The series takes its name from the San Francisco–Oakland Bay Bridge which links the cities of Oakland and San Francisco. Although competitive, the regional rivalry between the A's and Giants is considered a friendly one with mostly mutual companionship between the fans, as opposed to White Sox–Cubs, or Yankees–Mets games where animosity runs high. Hats displaying both teams on the cap are sold from vendors at the games, and once in a while the teams both dress in original team uniforms from the early era of baseball. The series is also occasionally referred to as the "BART Series" for the Bay Area Rapid Transit system that links Oakland to San Francisco. However, the name "BART Series" has never been popular beyond a small selection of history books and national broadcasters and has fallen out of favor. Bay Area locals almost exclusively refer to the rivalry as the "Battle of the Bay". In 2018 the Athletics and Giants started battling for a "Bay Bridge" Trophy made from steel taken from the old bay bridge which was taken down after a new bridge was opened in 2013. The A's won the inaugural season with the trophy, allowing them to place their logo atop its bay bridge stand. Players and managers listed in bold are depicted on their Hall of Fame plaques wearing a Athletics cap insignia. * – depicted on Hall of Fame plaque without a cap or cap insignia; Hall of Fame recognizes Athletics as "Primary Team"
** – Catfish Hunter could not decide between the Yankees and Athletics, and so opted to wear no insignia on his cap upon his induction. Names in bold received the award based primarily on their work as broadcasters for the Athletics. The Athletics have retired six numbers, and honored one additional individual with the letter "A". Walter A. Haas, Jr., owner of the team from 1980 until his death in 1995, was honored by the retirement of the letter "A". Of the six players with retired numbers, five were retired for their play with the Athletics and one, 42, was universally retired by Major League Baseball when they honored the 50th anniversary of Jackie Robinson's breaking the color barrier. No A's player from the Philadelphia era has his number retired by the organization. Though Jackson and Hunter played small portions of their careers in Kansas City, no player that played the majority of his years in the Kansas City era has his number retired either. The A's have retired only the numbers of Hall of Fame members who played large portions of their careers in Oakland. The Athletics have all of the numbers of the Hall-of-Fame players from the Philadelphia Athletics displayed at their stadium, as well as all of the years that the Philadelphia Athletics won World Championships (1910, 1911, 1913, 1929, and 1930). On September 5, 2018, the Athletics held a ceremony to induct seven members into the inaugural class of the team's Hall of Fame. Each member was honored with an unveiling of a painting in their likeness and a bright green jacket. Hunter, who died in 1999, was represented by his widow, while Finley, who died in 1996, was represented by his son. If the team ever gets a new stadium, a physical site will be designated for the Hall of Fame, as the Coliseum does not have enough space for a full-fledged exhibit. 17 members of the Athletics organization have been honored with induction into the Bay Area Sports Hall of Fame. The Athletics have all of the numbers of the Hall-of-Fame players from the Philadelphia Athletics displayed at their stadium, as well as all of the years that the Philadelphia Athletics won World Championships (1910, 1911, 1913, 1929, and 1930). Also, from 1978 to 2003 (except 1983), the Philadelphia Phillies inducted one former Athletic (and one former Phillie) each year into the Philadelphia Baseball Wall of Fame at the then-existing Veterans Stadium. 25 Athletics have been honored. In March 2004, after Veterans Stadium was replaced by the new Citizens Bank Park, the Athletics' plaques were relocated to the Philadelphia Athletics Historical Society in Hatboro, Pennsylvania, and a single plaque listing all of the A's inductees was attached to a statue of Connie Mack that is located across the street from Citizens Bank Park. The records of the Athletics' last ten seasons in Major League Baseball are listed below. Khris Davis (outfielder/hitter) has been called “the most consistent hitter in baseball history” with his 2014 to 2018 season averages of .244, .247, .247, .247, and .247. As of the 2019 season, the Oakland Athletics have had 14 radio homes. Since 2019, the Athletics' flagship radio station has been KTRB 860 AM "The Answer". The Athletics also have a partnership with TuneIn which includes a free live 24/7 exclusive A’s station to stream the radio broadcast within the Athletics market and other A's programming. The announcing team features Ken Korach and Vince Cotroneo. Television coverage is exclusively on NBC Sports California. Some A's games air on an alternate feed of NBCS, called NBCS Plus, if the main channel shows a Sacramento Kings game at the same time. On TV, Glen Kuiper covers play-by-play, and Ray Fosse typically provides color commentary. Kuiper and Fosse are frequently joined by Dallas Braden, who adds additional color from the field level. The 2003 Michael Lewis book Moneyball chronicles the 2002 Oakland Athletics season, with a specific focus on Billy Beane's economic approach to managing the organization under significant financial constraints. Beginning in June 2003, the book remained on The New York Times Best Seller list for 18 consecutive weeks, peaking at number 2. In 2011, Columbia Pictures released a film adaptation based on Lewis' book, which featured Brad Pitt playing the role of Beane. On September 19, 2011, the U.S. premiere of Moneyball was held at the Paramount Theatre in Oakland, which featured a green carpet for attendees to walk, rather than the traditional red carpet. ^ The team's official colors are green and gold, according to the team's mascot (Stomper)'s official website. ^ "About Stomper". Athletics.com. MLB Advanced Media. Retrieved August 21, 2018. ^ Clair, Michael (March 17, 2017). "Why do the A's wear green? You can thank Charlie Finley". MLB.com. MLB Advanced Media. Retrieved January 6, 2018. Before Finley came on board, the then-Kansas City A's wore baseball's standard blue-and-red combination. In 1963, that all changed as Finley outfitted the team in glorious gold (Finley said it was the same shade the United States Naval Academy used) and kelly green for the very first time. ^ "Oakland Athletics Team History & Encyclopedia". Baseball Reference. Sports Reference. Retrieved March 26, 2019. ^ Boxscore from Baseball-Reference.com "Wednesday, April 17, 1968, 7:46PM, Oakland–Alameda County Coliseum"
^ "American Association (19th Century) - BR Bullpen". www.baseball-reference.com. Retrieved January 15, 2018. ^ "Logos and Mascots". MLB.com. Retrieved September 26, 2016. ^ "Mascots you don't see on sports sidelines". May 22, 2007. ^ "Stomper's Place". Oakland Athletics. ^ "Oakland A's to wear kelly green alternate jersey for Friday home games". MLB.com (Press release). MLB Advanced Media. January 26, 2018. Retrieved January 27, 2018. ^ United Press International (January 30, 1979). "Yankees, Twins still dickering". St. Petersburg Times. Retrieved June 19, 2009. ^ "Cashman Field | Las Vegas 51s Cashman Field". Web.minorleaguebaseball.com. Archived from the original on April 22, 2008. Retrieved August 18, 2013. ^ Leavitt, Parker (October 24, 2014). "Mesa's Hohokam Stadium ready for Oakland A's". The Arizona Republic. Retrieved December 1, 2014. ^ "A's settle on a ballpark site and a futuristic stadium". The Mercury News. November 28, 2018. Retrieved November 28, 2018. ^ Dennis, Rob (December 30, 2011). "Fremont mayor Bob Wasserman dead at 77". The Argus (Fremont). Retrieved January 21, 2012. ^ "A's, Cisco reach ballpark deal". USA Today. November 9, 2006. Retrieved May 20, 2010. ^ "Full text of A's letter to Fremont". February 24, 2009. ^ Associated Press (June 16, 2010). "Plans for A's stadium in San Jose moving forward". USA Today. San Jose, California. Retrieved May 5, 2018. ^ "How the A's ballpark plans stack up". San Jose Mercury News. Bay Area News Group. August 24, 2010. Retrieved August 18, 2013. ^ Seipel, Tracy (September 8, 2010). "75 Silicon Valley leaders endorse A's move to San Jose". San Jose Mercury News. Bay Area News Group. Retrieved August 18, 2013. ^ Calcaterra, Craig (June 30, 2011). "In case you forgot, the Athletics are still in franchise limbo". HardballTalk. NBC Sports. Retrieved August 18, 2013. ^ Koehn, Josh (July 12, 2011). "Selig Talks About A's Move to San Jose". San Jose Inside. Sanjoseinside.com. Retrieved August 18, 2013. ^ Associated Press (June 19, 2013). "San Jose sues MLB over A's vote". San Francisco, California: ESPN. Retrieved August 18, 2013. ^ Associated Press (January 15, 2015). "San Jose loses appeal over A's move". San Francisco, California: ESPN. Retrieved January 17, 2015. ^ Egelko, Bob (October 5, 2015). "U.S. Supreme Court rejects San Jose's bid to lure Oakland A's". SFGate. Hearst Communications, Inc. Retrieved August 19, 2015. ^ "Proposed site for A's ballpark falls through". USA Today. AP. December 6, 2017. ^ "Head-to-Head record for Oakland Athletics against the listed opponents from 1997 to 2018". baseball-reference.com. ^ Goldberg, Ron (March 24, 2018). "Athletics Offer $20 Parking Discount to Giants Fans Who Yell 'Go A's' at Gates". Bleacher Report. Retrieved March 26, 2018. ^ "2014 Promotional Schedule". Oakland Athletics. ^ For photos of the A's Wall of Fame plaques, see Philadelphia A's Society Museum and Library Archived December 29, 2005, at the Wayback Machine webpage. Philadelphia Athletics Historical Society. Retrieved September 23, 2010. ^ Philadelphia Athletics Historical Society Archived September 27, 2010, at the Wayback Machine official website. Retrieved September 23, 2010. ^ Fitzpatrick, Frank (February 22, 2011). "Demographics may doom the Philadelphia Athletics Historical Society". philly.com. Philadelphia Media Network (The Philadelphia Inquirer). Archived from the original on February 26, 2011. Retrieved February 23, 2011. ^ For photos of the plaque, see Montella, Ernie (June 5, 2004). "Wall of Fame Day in Hatboro, Pennsylvania". Philadelphia Athletics Historical Society. Archived from the original on December 19, 2010. Retrieved September 23, 2010. ^ Jordan, David M. "Vet Plaques Come to Hatboro". Philadelphia Athletics Historical Society. Archived from the original on September 6, 2008. Retrieved September 23, 2010. ^ "Khris Davis". Baseball Reference. ^ "Athletics Affiliates". Oakland Athletics. Major League Baseball. Retrieved September 11, 2014. ^ "Oakland A's confirm split with radio flagship via Twitter". The Mercury News. October 13, 2018. Retrieved October 29, 2018. ^ "A's announce new radio partnerships for upcoming season". The Mercury News. February 15, 2019. Retrieved February 17, 2019. ^ "The New York Times Best Seller List - June 22, 2003" (PDF). Hawes Publications. Retrieved April 23, 2014. ^ "Oakland shines for 'Moneyball' premiere". San Francisco Chronicle. Retrieved April 23, 2014. Jordan, David M. The Athletics of Philadelphia: Connie Mack's White Elephants, 1901–1954. McFarland & Co., Jefferson NC, 1999. ISBN 0-7864-0620-8. Katz, Jeff. "The Kansas City A's & The Wrong Half of the Yankees." Maple Street Press, Hingham, Massachusetts, 2006. ISBN 978-0-9777436-5-0. Kuklick, Bruce. To Everything a Season: Shibe Park and Urban Philadelphia 1909–1976. Princeton University Press, Princeton NJ, 1991. ISBN 0-691-04788-X. Lewis, Michael. Moneyball: The Art of Winning an Unfair Game. W. W. Norton & Co., Inc., New York, 2003. ISBN 0-393-05765-8. Peterson, John E. The Kansas City Athletics: A Baseball History 1954–1967. McFarland & Co., Jefferson NC, 1999. ISBN 0-7864-1610-6. Slusser, Susan. 100 Things A's Fans Should Know & Do Before They Die. Triumph Books, Chicago, 2015. ISBN 978-1629370682. This page was last edited on 23 April 2019, at 18:33 (UTC).